Keep your guitar in an environment that is between 40-50% relative humidity. Avoid extremes of temperature - 68 degrees Fahrenheit is about right. Subjecting a guitar to an extreme change in temperature can make the finish crinkle. Keep your guitar in a case when traveling. When going outside - or into any environment where the temperature is not around 68 degrees or the humidity 40-50% - put your guitar in a case. Don't leave your guitar in an abnormal environment for very long - even when it's in a case. Even just fifteen minutes is probably too long in a soft shell case (fabric) if the temperature is too hot or cold. Winter months are often too dry for your guitar (year-round in arid climates), especially if you have electric heat in your house, apartment, or office. Make sure your guitar gets enough humidity. A guitar can crack from lack of humidity after only a few weeks of winter weather combined with electric heat - plus it can start to buzz and otherwise perform less well. The time your guitar can be kept in a case in an abnormal environment can vary depending on the quality of the case. Some cases are designed to protect your guitar better than others. If your guitar has been in a case in a cold/hot/dry/humid environment for a significant period of time - around fifteen minutes or more - leave it in the case for a while when you are back in a normal environment. Let the guitar gradually acclimate in the guitar case. Immediately removing a guitar from a case when it has been in extreme temperatures can cause surface cracks - a crinkling of the finish that is expensive to repair. Don't let your guitar get knocked around. Keep it in a safe place. If you can't afford a humidifier to keep the ambient humidity between 40-50%, buy a guitar-case humidifier. Store your guitar in the case when you're not playing it so that the guitar can soak up the humidity from the in-the-case humidifier. The wood in my steel string acoustic guitar cracked several decades ago when I moved from a basement apartment into a second-story apartment heated with electric heat. It took only two weeks in the new apartment to crack! Lesson learned! You can make a guitar-case humidifier out of a sponge and a sandwich bag. Get the sponge wet then ring it out so it's damp but not dripping wet. Place the sponge in the sandwich bag but do not seal the bag. Place this homemade guitar humidifier in your guitar case and store your guitar in the case when you're not playing it. (This works best with a hard shell case because it seals more tightly than a soft shell one.) Don't let the sponge directly touch your guitar. Check the sponge every day and keep it moist. Although this isn't the ideal way to keep your guitar from drying out in the winter months, it will work in a pinch. A luthier I know sometimes makes guitars for a client who lives in an arid climate. He dries the wood out before the guitar is assembled. In this case, too much humidity is probably bad for the guitar. Most guitars are not made this way however. Direct exposure to the elements, like sun, rain, and snow, should be avoided. Clean your guitar with a lint-free smooth cloth using a little bit of water. Wipe the guitar completely dry afterwards so that no moisture remains. You can buy products made to clean your guitar but plain old water will usually do the trick. Don't use water to clean electronic or moving parts. Electric guitars - especially solid body ones - are generally more resistant to extreme environments than acoustic guitars. Although the body of a solid body guitar is less affected by low relative humidity, the neck will often exhibit problems. Frets that stick out from the sides of a guitar neck are one of the common signs that a guitar neck has shrunk due to low humidity. (This could be a sign of poor workmanship too.) You may also notice more fret buzz and a change in the action. The solution is to provide an environment of 40-50% relative humidity. It is better to do this than to seasonally adjust the truss rod and bridge to compensate for the low humidity. Tune your guitar every time you play it. Keeping it tuned to standard pitch keeps your guitar operating in the condition it was set up for. Don't place your guitar near an air conditioner, heat vent, or open window. If you store your guitar on a stand, make sure the stand is sturdy. One tumble and your guitar can break. Put some extra foam lining in your guitar case for extra protection, especially behind the headstock in a hard shell case. 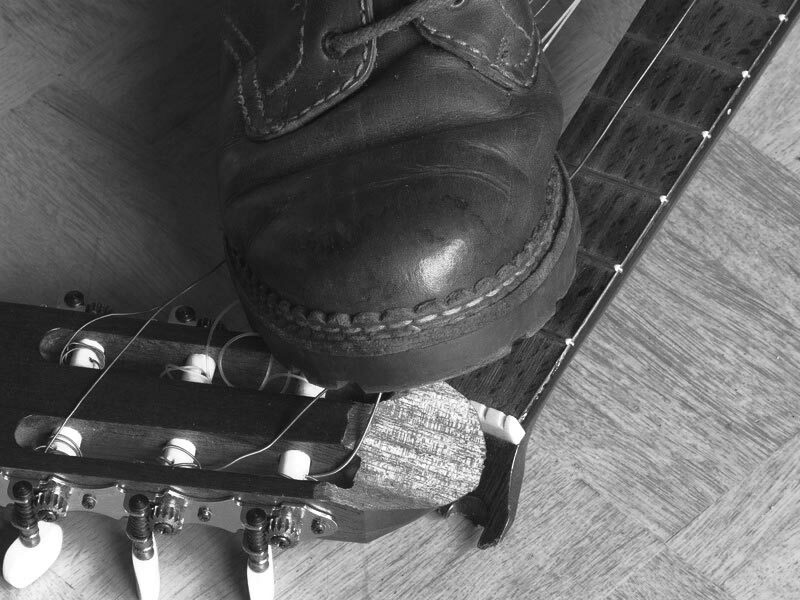 Ordinary socks will work quite nicely in a hard shell case to protect the headstock. Always check to make sure your guitar case is latched before you pick it up. It is very easy to forget to latch the case. It only takes once to lift an unlatched case to realize that the guitar will fall out and get damaged! If you can afford it, get a hard shell case. It will offer much better protection. One of my former students tried a brilliant - but controversial - method of fixing his extremely dried-out electric guitar. The guitar neck had become warped and bent due to low humidity. What did he do? He left the guitar in his bathroom with the shower running hot steamy water for a significant time. (I presume that he didn't leave it in the bathtub!) Believe it or not, the guitar soaked up the humidity like a sponge and almost miraculously repaired itself! But - as they say on TV - this might not be something you should try at home. :-) It's probably better to leave this kind of extreme repair to an expert luthier. If you are traveling by airline (this probably applies to train and bus travel as well), make sure you have a hard shell case (read the "IMPORTANT" section below too). Do everything you can to carry the case on with you and get it stored in the passenger compartment. IMPORTANT: NEVER let the airline store your case in the baggage section unless you have one of the heavy-duty cases made by Hoffee or a similar company. These cases are not cheap (more than a thousand dollars) but they are designed to protect your guitar under the extreme kind of treatment that airplane baggage handling can dole out. You could buy an extra seat for your guitar of course, but not many people have the disposable income to do that. About a decade ago I traveled to China to perform concerts and conduct master classes with violinist Eric Lawson at universities in Shanghai and Nanchang. Although I had a hard shell case for my classical guitar, it wasn't one of the extra strong ones that companies like Hoffee make. Thankfully I got lucky: For every flight I simply walked on with my guitar and the stewardesses politely asked to store it in a clothes closet or in first class seating. (We didn't even fly first class!) I don't know what I would have done if the airlines had insisted that my guitar be stored in the baggage compartment. Several decades ago, one of my former students had allowed his guitar (in a case) to be stored in the baggage section. After the flight, he found that his guitar had been broken by the airline. Because of his experience - and others I've heard about over the years - I would never let my guitar get stored in the baggage compartment. If you plan on using public transportation you should make careful plans to make sure your guitar will survive the trip. There are many more things you can do to take care of your guitar, but they are more advanced than this simple page is meant to cover. These are just basic things to keep in mind to keep your guitar in good condition.